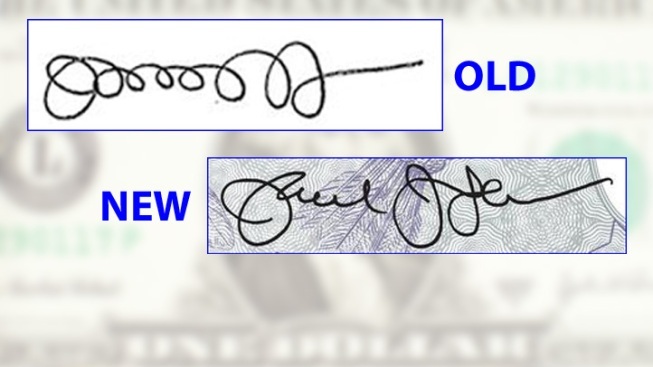 Treasury Secretary Jack Lew has created a new signature that will appear on dollar bills starting this fall. Treasury Secretary Jack "Lewpty" Lew has a new and improved signature – and it will soon be appearing on your dollar bills. Some people, including President Barack Obama, thought Lew needed to improve his penmanship and worried about his illegibly loopy signature being showcased on U.S. currency. "Jack assures me that he is going to work to make at least one letter legible in order not to debase our currency," Obama joked back in January. Apparently Lew has done some work on his John Hancock. The Treasury Department tweeted a photo of his new signature Tuesday afternoon that is set to premiere on dollar bills this fall. The new one is less loopy, but it still isn’t that legible. It’s not the first time a Treasury Secretary has tried to change his signature before its dollar debut. Lew’s predecessor Timothy Geithner did the same, saying he wanted to make his name legible.